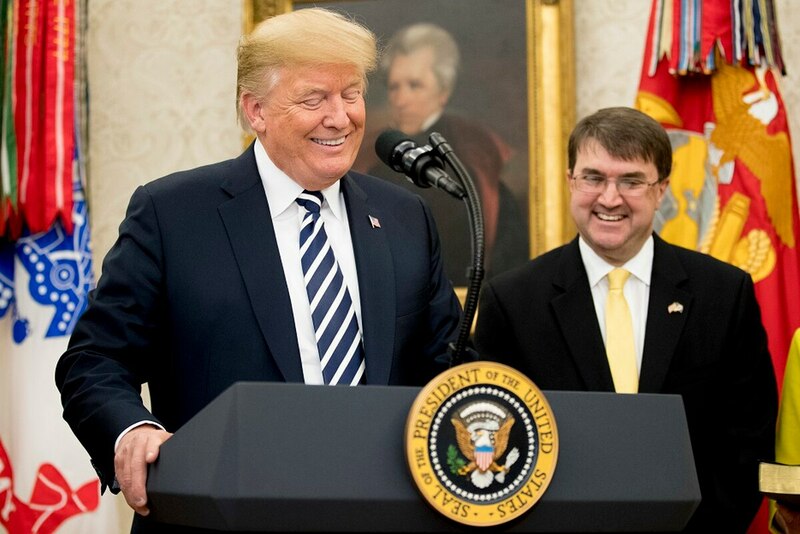 WASHINGTON — In his first public speech since taking over the Department of Veterans Affairs, VA Secretary Robert Wilkie on Wednesday reiterated his promises to push that bureaucracy towards more customer-friendly practices and more flexible access for beneficiaries. The comments echoed ones Wilkie made less than two months ago during his confirmation hearing on Capitol Hill, where he pledged to bring a more user-friendly experience to veterans navigating the massive federal bureaucracy. Unlike that testimony, Wilkie did not explicitly state he opposes privatization of department health programs during his AMVETS speech, although he appeared to back up that previous vow. Robert Wilkie steps into a department which has seen multiple accomplishments and multiple headaches in recent months. The topic has been a point of contention among lawmakers, veterans groups and administration officials in recent years, and was amplified with the firing of former department Secretary David Shulkin in March. Wilkie noted one of his first tasks as President Donald Trump’s newest Cabinet secretary will be overseeing sweeping health care reforms for the department signed into law in June. He said that work will include creating more “choices” for veterans seeking medical care, but also spoke of the importance of preserving the current VA health care system. “One absolutely essential option (for veterans) is the availability of care from professionals who specialize in treating America’s veterans,” he said. “Professionals who speak the language, who know what you have been through, who know what your special needs are. Before the speech, Wilkie signed a memorandum with AMVETS leaders to continue work on suicide prevention efforts. The new secretary has said he will keep that issue as his top clinical priority, the same as Shulkin. The event included no mention of the last four months of leadership drama at the department, which included the implosion of former White House physician Adm. Ronny Jackson’s nomination to take over the nearly $200 billion veterans administration. Wilkie’s confirmation vote marked the first time in Senate history that any lawmaker had opposed a VA secretary nominee, although the nine votes against him were viewed largely as protests against Trump. Wilkie did thank AMVETS officials for their support of his nomination and for their collaboration during his two months as acting secretary, and promised similar partnership in coming months.